US Secretary of State Condoleezza Rice has ordered new measures to improve government oversight of private security contractors used in Iraq. It follows a review by an independent panel ordered after an incident last month involving the US firm Blackwater, in which some 17 Iraqi civilians died. The steps include tightening the state department's rules of engagement so they are in line with the military's. Contractors will also have to undergo improved cultural awareness training. There will also be better co-ordination with the US military and tighter restrictions on the use of force. Boards will be set up to investigate any future killings involving private contractors in Iraq, and they will have the power to refer cases to the US justice department. Contractors will also have to have Arabic speakers on hand. Ms Rice, who was briefed on the report on Monday "has decided to move ahead with the recommendations that are within her purview to act on immediately", state department official Patrick Kennedy said. Mr Kennedy, who led the review panel, said its recommendations would clarify the rules of engagement for private contractors. The panel has emphasised that they should open fire only with "due regard for the safety of innocent bystanders". However, its recommendations focus on management and policy relating to security contractors rather than any possible wrongdoing by Blackwater or others, Mr Kennedy told reporters. "Prompt measures should be taken to strengthen the co-ordination, oversight and accountability aspects of the state department's security practices in Iraq in order to reduce the likelihood that future incidents will occur," the report said. State department spokesman Sean McCormack said earlier that some of the review panel's recommendations would require co-ordination with the Pentagon. 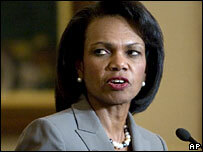 Ms Rice is expected to meet Defence Secretary Robert Gates later this week to discuss those changes. Earlier this month, Ms Rice ordered that a member of the state department's own security staff accompany all Blackwater-escorted diplomatic convoys and that video cameras be installed in the firm's security vehicles. The Blackwater incident in Baghdad strained relations with Iraq and forced the state department to act, the BBC's Jonathan Beale in Washington says. 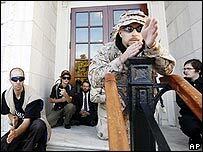 An Iraqi government investigation concluded that Blackwater guards fired on civilians without provocation. Iraqi leaders have demanded that the US government end its association with Blackwater in Iraq within six months and hand over the contractors involved in the 16 September incident. Blackwater's chairman, Erik Prince, has insisted he has proof that the firm's guards were fired upon and has defended its record before the US Congress. US officials have released few details of the incident, as it is subject to an investigation by the FBI.